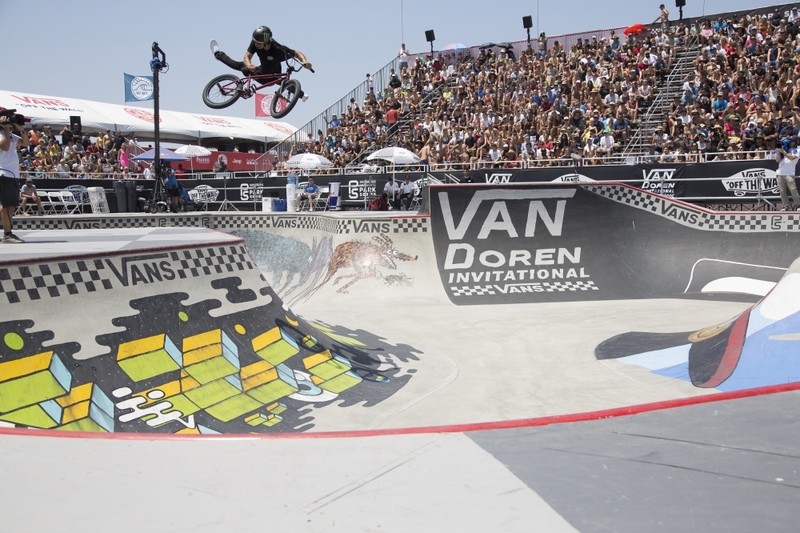 The 2016 Van Doren Invitational ended with a bang when several riders blasted the deep end of the bowl in front of packed bleachers and a 14 foot tall height pole. Larry Edgar from Corona, CA aired the highest, almost clearing the pull on a few attempts. The Best Line award (from riding during the prelims) went to Australia’s Dylan Lewis, with his massive transfer from shallow to deep to massive inverted table. 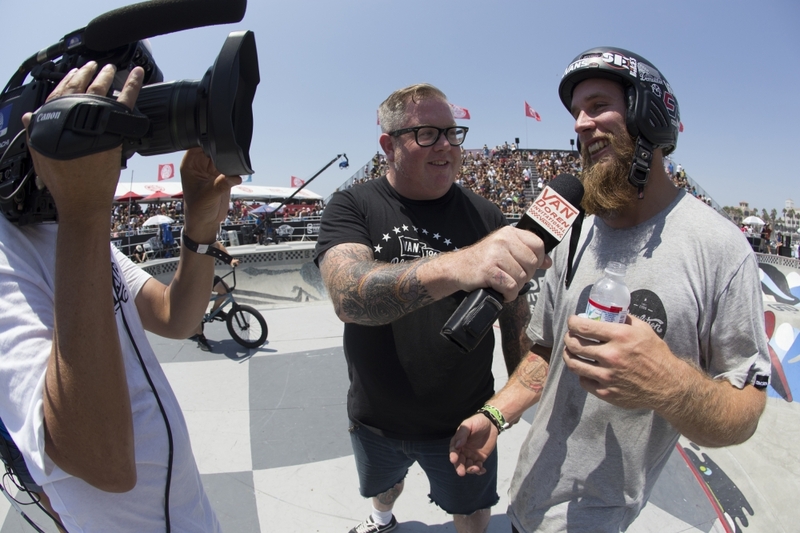 Canadian Corey Walsh won the Best Trick award with a pocket air from the Van Doren Quarter all the way to the swan extension. 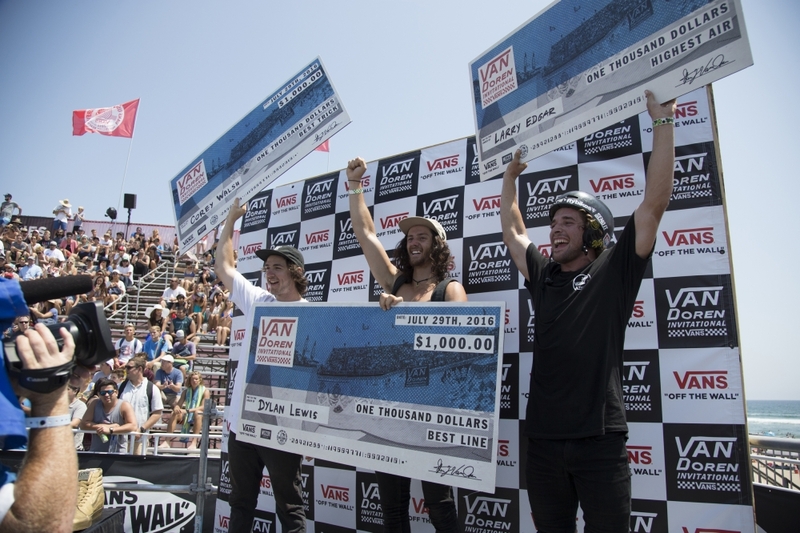 The level of riding in the Finals was unreal again, with riders stepping it up while staying consistent. 3 riders from California who always ride well, did so again. 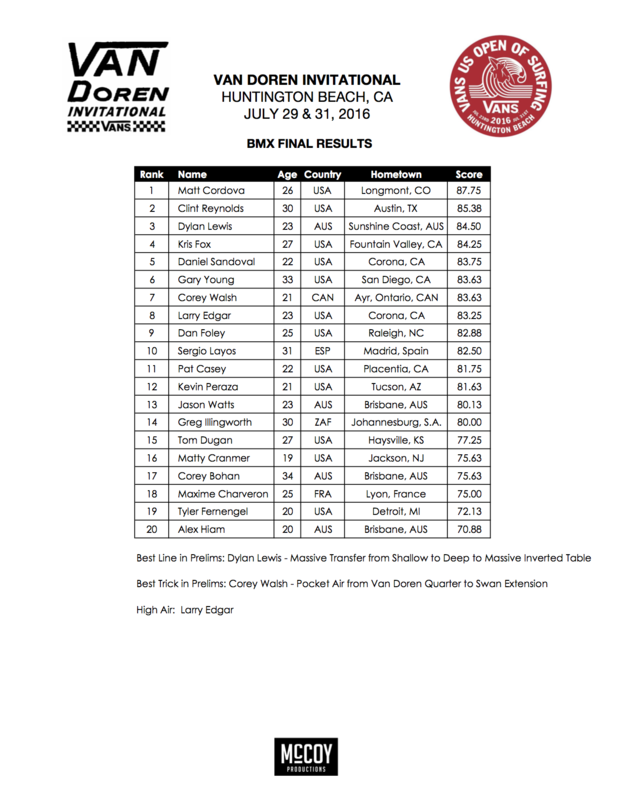 Past VDI winners Daniel Sandoval and Gary Young placed 5th and 6th respectively – highlights include Daniel’s triple whip and Gary downside grinding the bowl corner in both directions. Kris Fox earned a well deserved 4th place by riding faster than ever and carving for days. 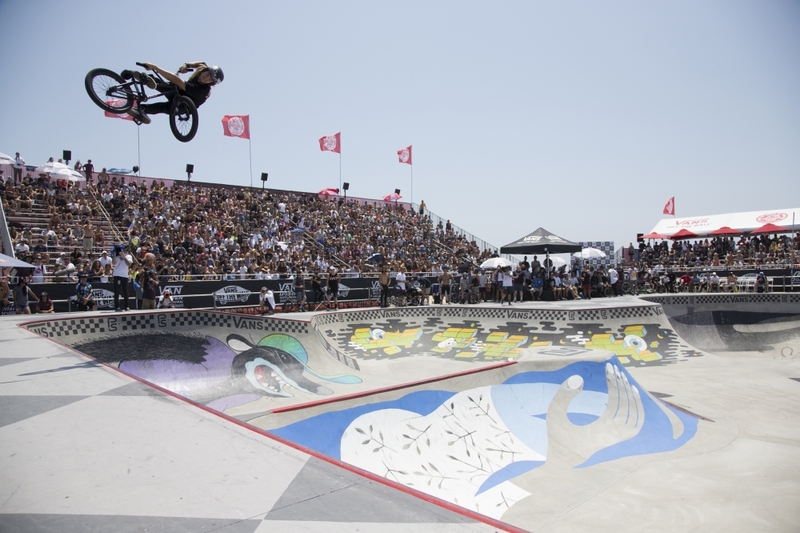 Dylan Lewis made the podium at his first visit to this event by doing everything at height, clicking turndowns and inverting tables to perfection. Traveling all the way from Sunshine Coast, Australia, Dylan’s 3rd place finish advances him directly to next year’s VDI finals. Austin, TX resident Clint Reynolds followed up his win in prelims with a solid 2nd place finish in the finals. His runs were packed with style, flow and originality. The 2016 Van Doren invitational Champion is Matt Cordova from Longmont, CO. Currently residing in California, Matt rode great from the first day of practice. 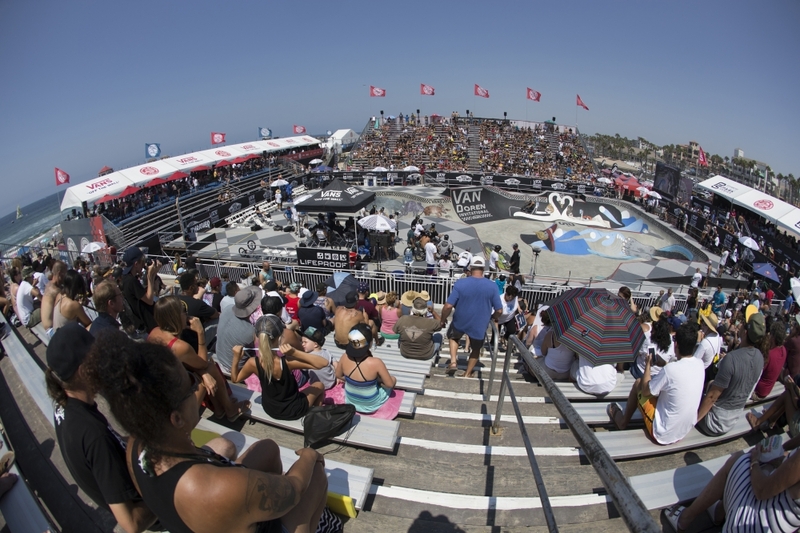 It all came together on Sunday, when every trick he did was high and tweaked, flowing perfectly into the next trick. His final run was capped off with a tailwhip on the longest transfer on the course, from the far end of the elbow into the deep end of the bowl. Good times were had by all. 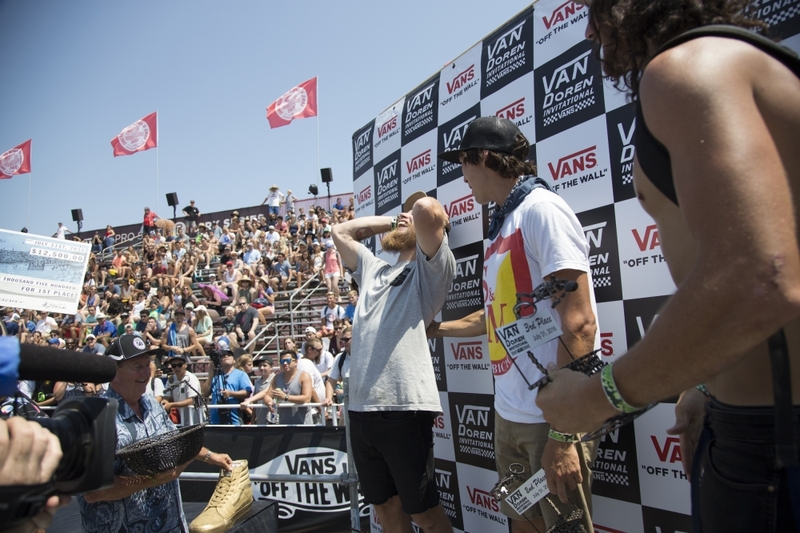 Thanks Vans and the Vans US Open!